Rare’s multiplayer pirate extravaganza Sea of Thieves is currently enjoying a discount of 50% on Xbox One and PC, ahead of its massive, game-changing Anniversary Update, due at the end of the month. Sea of Thieves’ Anniversary Update is an absolute belter, introducing, among many other things, a brilliantly raucous, quick-fire competitive mode known as The Arena. This is completely standalone to Sea of Thieves existing mode, which will be renamed Adventure Mode come the Anniversary Update’s arrival on April 30th. 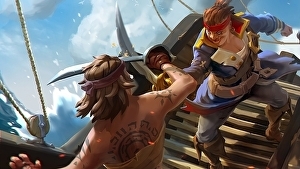 Adventure Mode, while we’re on the subject, will also receive Sea of Thieves’ first hand-crafted story campaign as part of the update – a sizeable offering spanning nine chapters, in which fearless crews must roam the seas in search of a mysterious island known as the Shores of Gold.